Imagine an electronic device that exists permanently within your body, monitoring your biological signals and administering medicine when you need it. Such a device could revolutionize modern healthcare. But how would you power it? To answer this question, we have to consider not only how much power we need, but also the characteristics of the power source. Traditional batteries used in laptops and smartphones rely on toxic chemicals to generate electricity; keeping such a battery in the body permanently could be very dangerous. And what happens when the battery has completely discharged? Replacing or externally recharging this kind of power source would require surgical removal and reinsertion of the device. The ideal battery for this application would be completely biocompatible, and would be rechargeable within the body. Using batteries is not the only way to generate electricity. One form of electricity, known as bioelectricity, is created within living organisms—including inside the human body! This phenomenon relies on the separation of charged ions across biological cell membranes. Ions often exist in different amounts inside and outside the cell. The natural tendency of these ions is to move from high concentration to low concentration, but the cell membrane is selectively permeable, only allowing ions with a certain charge to cross. The result is a buildup of positive charges on the membrane’s outside surface and of negative charges on its inside surface, creating an electrical potential, otherwise known as a voltage (Figure 1). 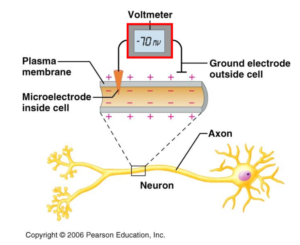 If, in response to a stimulus, ions are briefly allowed to flow freely across the cell membrane, the movement of charge across the voltage creates a small electric current. This is how nerve impulses are produced and transmitted. While humans can only generate very small amounts of bioelectricity, the electric eel can create hundreds of volts—enough to completely paralyze its prey, or seriously harm a person who comes too close. 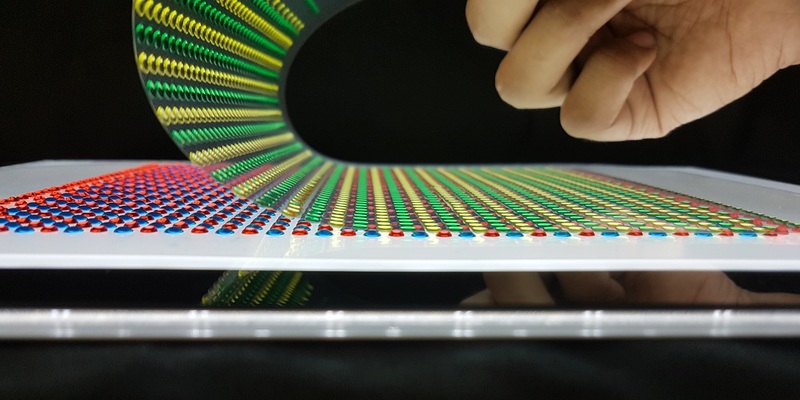 It creates this large discharge by stacking thousands of its cells back-to-back; in this way, the voltages of the cells add together, just as they do if you connect many AAA batteries in series. The eel even has a self-recharging mechanism, using pumps in its cell membranes to push the ions back where they came from so they are ready for the next shock. This intriguing system led us to a simple question: if the eel can do this, why can’t we? We applied the eel’s principle of stacking membranes to generate electricity, but instead of using living cells, we used water-filled gel materials called hydrogels. 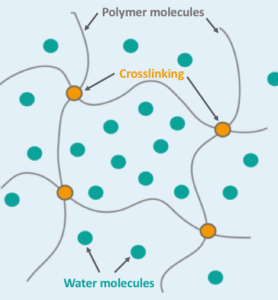 Hydrogels are made up of long, chain-like molecules called polymers; when these polymers “crosslink,” they create a network that traps water molecules (Figure 2). This trapping of water within the polymer structure creates hydrogels’ characteristic Jello-like consistency—in fact, Jello is itself a hydrogel! 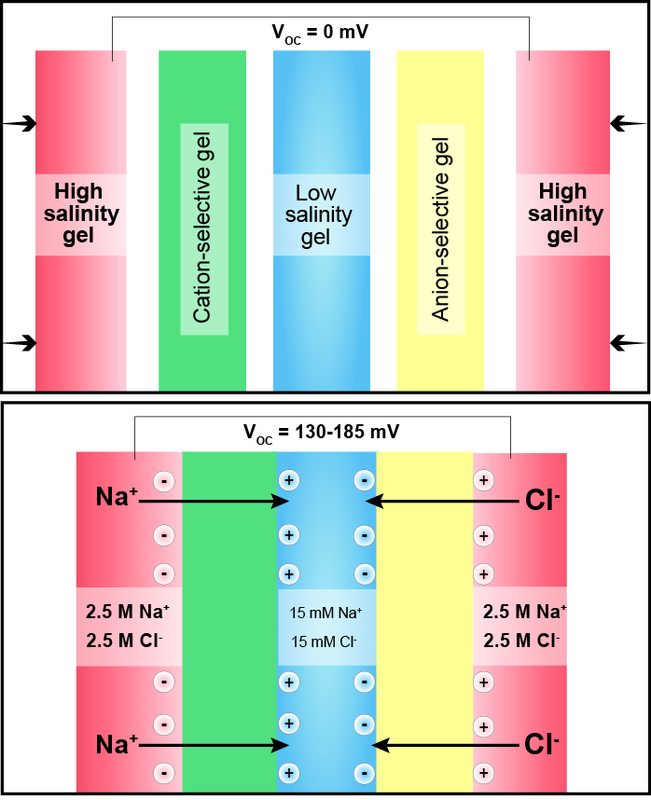 In this research, we created two types of hydrogels, one containing a high concentration of salt and the other a low concentration of salt. We connected these across another gel that allowed only positive or negative charges to cross, separating the charges to create a small voltage (Figure 3). By stacking many of these gels back-to-back, as the eel does with its cells, we could generate very large voltages. 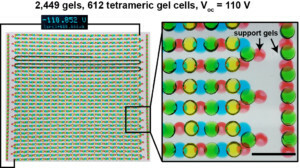 We used a printer to create a series of thousands of small gels (Figure 4), producing over 100 volts on a sheet the size of a normal piece of printer paper! For comparison, a typical alkaline battery used to power small electronics produces an electric potential of 1.5 volts, while a car battery generates 12 to 15 volts. This energy generation system has several advantages over conventional batteries. Hydrogels are flexible and moldable, so they can fit any shape. They can also easily be made biocompatible; in fact, hydrogels are already used to make modern contact lenses. In addition, since the power is generated from ions, which exist throughout the human body, it is possible to imagine that the system could be recharged automatically after it discharges, creating a continuous power supply. While numerous challenges still remain, this hydrogel energy source may in the future be used to power the next generation of implantable electronics. To learn more about these “electric eel batteries,” watch the video below! Fig. 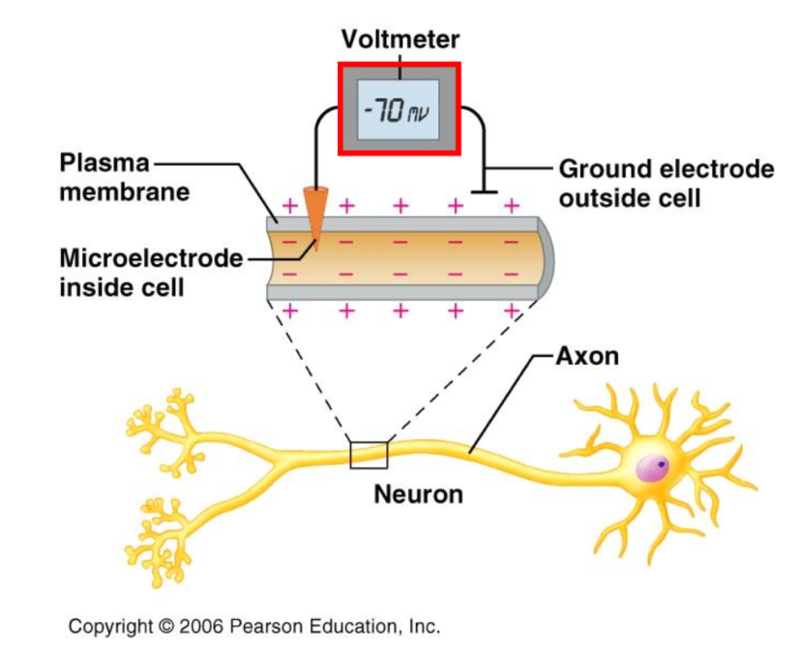 1 (Click to enlarge) At rest, a human neuron has a charge difference, or voltage, of about -70 millivolts, meaning that the inside of the membrane is negatively charged compared to the outside. When these charges are briefly allowed to move freely, a small amount of electric current is generated. Fig. 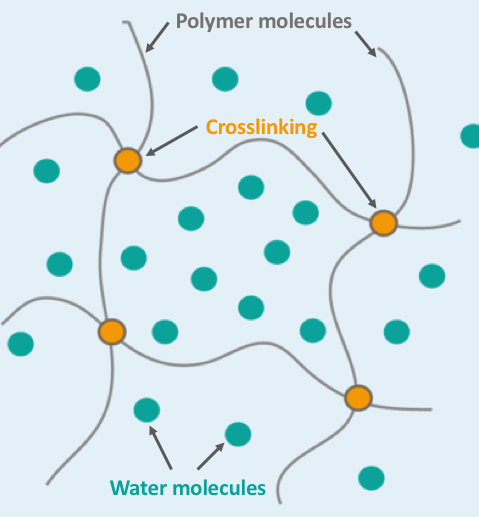 2 (Click to enlarge) In a hydrogel, long polymer molecules crosslink to create a mesh-like structure that traps water molecules. Fig. 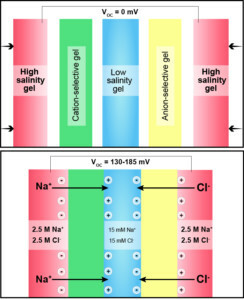 3 (Click to enlarge) Alternating high-salt (red) and low-salt (blue) hydrogels are stacked across alternating membranes selective for positively-charged ions (green) or negatively-charged ions (yellow). When out of contact (top), no voltage is generated. When pushed into contact (bottom), this repeating unit of hydrogels produces a voltage of 130-185 millivolts. Fig. 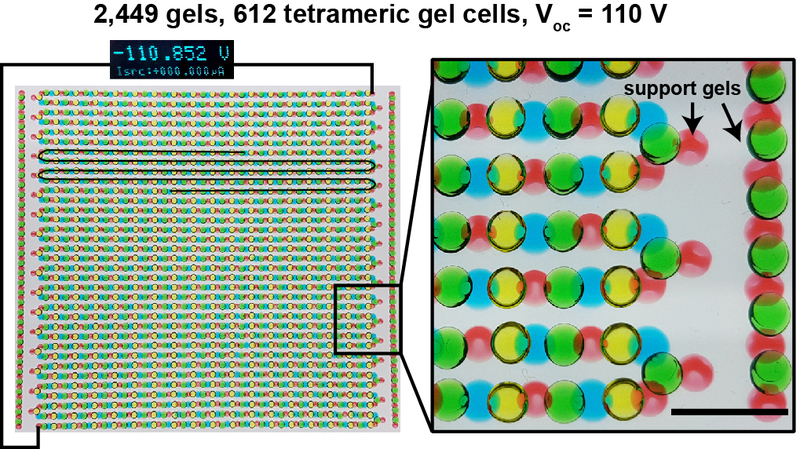 4 (Click to enlarge) Thousands of gels connected in sequence generates 110 volts. Scale bar = 1 cm.